Shower commodes can provide freedom and flexibility to those who need them. For a person who has difficulty taking a shower due to mobility and incontinence issues, shower commodes can become a valued part of their daily lives. 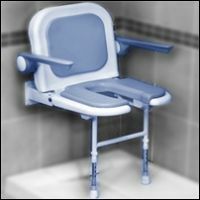 Shower commodes are movable chairs that allow the handicapped and the incontinent to take or receive a shower without concern about their incontinence or mobility issues. Shower commodes are rust-resistant and ready for transporting or self-maneuvering. They are also designed to fit over most toilet bowls or be used as a portable toilet with the removable commode pans. At their most basic, a shower commode is a heavy-duty, but lightweight, chair mounted on rolling swivel wheels with a toilet-style seat. Typically made from stainless steel or aluminum, PVC models are also available. Various seats, backrests, headrests and levels of complexity exist, including tilting shower commodes, high back shower commodes, motorized and even portable travel shower commodes. Some commode models are stationary, for those who are partially mobile, but still need the protection from incontinence that a shower commode can provide. There are bariatric shower commode chairs that support the weight of heavier users and can be used without fear of breaking or being unstable. 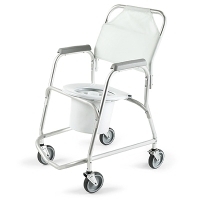 Mobile bariatric shower commodes with wheels can be a great assistance for caregivers who take care of heavy patients. Many handicap showers offer a roll in design for shower commodes to pass over the tub curb. With a low curb, commode users can shower in their waterproof chairs and be transported easily. Commodes are covered by Medicare but in the case of shower commodes, they are typically not covered. Companies may offer financing and grants on these products. Prices can range from 100 dollars to 3000 dollars and up for the motorized high end models. To families and individuals who need them, shower commodes are a necessary part of their daily life. Due to the portability of commodes, they are favored over handicap shower benches or handicap shower seats. The more complex commode models allow for various levels of manipulation for those who have less control of their limbs or movement. Motorized commodes allow people, who cannot walk, the ability to take their own showers. Portable shower commodes allow families and individuals the chance to travel and stay in hotels without worrying about shower accommodations.